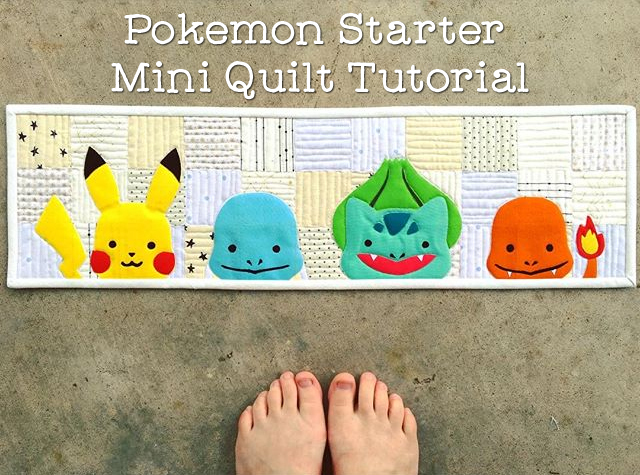 I post my impromptu Pokemon starter mini quilt yesterday on Instagram and today I'm sharing a tutorial so you can make your own! Start by piecing your low volume squares into (3) rows of (11) squares each, then sew those rows together to make a 25.25" x 7.25" background. Trace the template components onto the fusible web, fuse to the wrong side of your fabric, and cut out with scissors. Now start fusing your pieces to the background, starting with the bottom layers, working up to the top. Normally you'd stitch around each piece using a blanket or applique stitch to secure it, but since I'm just hanging mine on the wall where it won't be handled, I skipped this step. Once all your pieces are fused, baste your quilt sandwich and quilt away! I did straight lines in my background with white thread, then switch to transparent thread to quilt around some of the details in my Pokemon to give them more dimension (like around Pikachu's cheeks, Bulbasaur's mouth, etc). After that, all that's left is to bind it off and hang it up! Awesome mini! Thanks for sharing. I love it!!!!! Had to make one immediately! Awesome~ I am making one for a coworker! Actually, she is cutting out the pieces and I am going to quilt it for her.